Brand new to the homestay market The Green Villa is situated a five minute stroll to the Square. 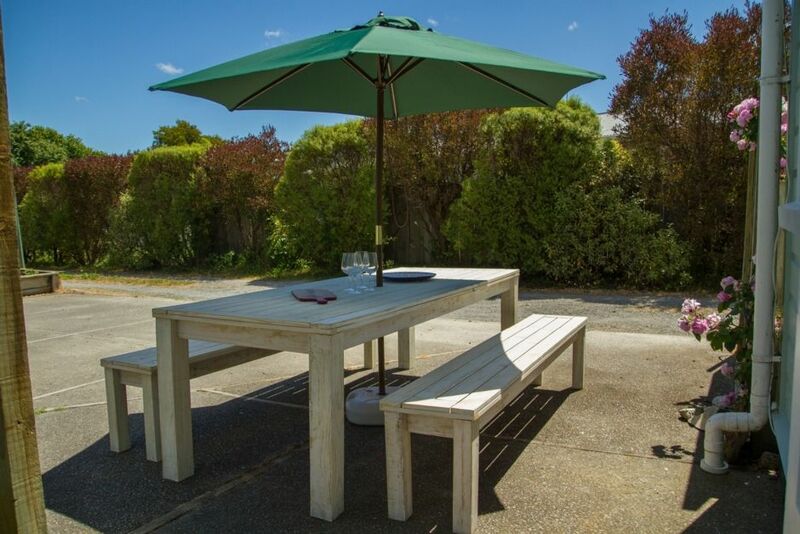 Perfect for a group of family or friends to relax and enjoy all Martinborough has to offer. On arrival you will find three bedrooms; one queen bedroom, one double bedroom and our third room has two king singles that can be reconfigured to a king and a single trundler. The lounge holds a fold down sofa bed also for two. The Green Villa is the perfect getaway for any time of the year. Entertaining is a breeze with the open plan dining and living area. An air conditioning unit to keep you cool in summer and our fabulous wood burner to heat in winter. Coffee, tea, milk are provided for your stay. Check in is available from 2pm and check out 10am. Please note Toast 2019 is available at a set price of $1800 for three nights and up to eight guests. We do charge a bond of $100 refunded after your stay when all is well with our property. Dogs are welcome at a charge of $10 per day - please note we are not fully fenced. Smoking is permitted outside please use our ashtrays provided. Event Weekends have a set price please enquire. Toast 2018 is available at a set price of $1800.00 for three nights. Long Weekends are a minimum three night stay or three night charge. 3 couples stayed here for a weekend getaway for the martinborough fair. A cosy cottage, everything and more than we needed. Clean and comfortable, lovely beds. Walk to town in ten minutes. The house is within walking distance to the town square, wineries and the local swimming pool - so convenient, The beds are amazingly comfortable, everything we needed was available and we had a great stay! Beautiful place, plenty of space, handy location, loved the big fluffy towels! The villa was perfect for our weekend away. The interior is even more beautiful and spacious than the photos indicate, and I appreciate our extra guest being accommodated so easily. Wish I had time to enjoy the hammock. Fabulous spot - walking distance to the square. Clean, tidy and lots of extra provisions in kitchen that were a nice surprise. Would highly recommend. Lovely place to stay. Well presented and very good location. Had a great weekend cycling around the vineyards. This place was a great location and provided a perfect base. A lovely place to stay. Well kitted out and a lovely location. We would definitely stay again.